While chiropractic is remarkably effective for pain relief, it does so much more. Chiropractic can allow you to enjoy improved function, better overall health and a higher quality of life. At Active Care Chiropractic, we love to see patients of all ages and with all conditions be the best they can be. Dr. Mark Wogahn has more than three decades of experience, and provides safe, gentle and effective care at his two locations—Tarzana and Woodland Hills, Encino, Westlake Village. In addition to offering exceptional spinal work, Dr. Wogahn also provides extremities adjusting. He is one of only a few chiropractors in the region who perform extremities adjusting. This form of chiropractic is effective for numerous conditions such as ankle pain, hip pain, swollen knees, shoulder sprains and carpal tunnel syndrome. As a Certified Chiropractic Extremity Practitioner (CCEP), Dr. Wogahn has gotten incredible results for his patients, many of whom travel from outside the area to see him. One of his patients suffered from longtime ankle pain. After Dr. Wogahn adjusted his ankles, this former cross country runner went on to run several LA Marathons. We are pleased to offer state-of-the-art BEMER therapy at the practice, which utilizes Tesla waves to get nutrients to the cells of the body and accelerate the body’s ability to detoxify. BEMER enhances blood flow and heart function, promotes fitness, boosts energy, improves concentration, fosters relaxation and much more. Many people don’t know all that chiropractic can do for them. “I find out what a patient is looking for, meet them where they are and all of a sudden their life improves,” says Dr. Wogahn. He finds it fulfilling to see people change their mindset about what chiropractic can do. The first introduction Dr. Wogahn had to chiropractic was as a child when he witnessed how it helped his mother get relief from her neck pain. He also experienced firsthand the effectiveness of chiropractic on his headaches. Dr. Wogahn takes the time to listen to his patients, ask good questions, provide a thorough exam and give gentle care that gets results. Find out why our chiropractor gets many referrals from other area doctors. 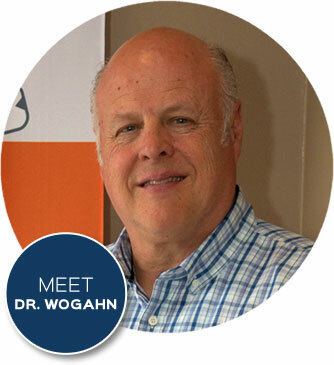 Book an appointment with Dr. Wogahn today! What a blessing to find Dr. Wogahn, he has been a tremendous help to me. I felt much better after 1 visit.